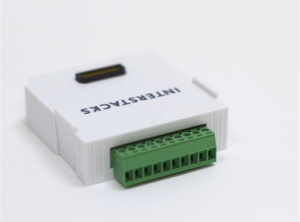 Connect your stack to a RS-485, multi-drop serial network. Set your baud rate (speed) and whether you want a network termination resistor via properties in the blueprint you create using the Stackbuilder authoring tool. There are many message protocols that run on RS-485 networks, for example MODBUS. Use built-in software blocks or software blocks you create using Python scripting in Stackbuilder, to parse and send messages. 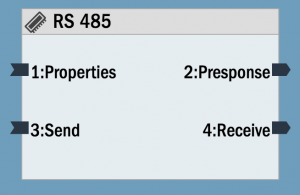 To set properties in Stackbuilder: Select the RS-485 block by clicking on it once. Click in the “Property Editor” in the bottom right, in the “Initial Value” column for the property you want to edit (if a character or string, use quotes). The A (D-) and B (D+) screw terminals are used to connect to the network. u_baud (B) (int): Uart baud rate. default 9600 baud. u_resistor (R) (int): If 1, connect the 120 ohm network terminating resistor. 0 to not connect (default). “Send” – in (String, Binary, int): send string to UART, we only send valid ascii portion. Also accept binary raw bytes. Also int < 256. send out as raw byte. “Receive” – out (String): Single byte received by UART. sent as String.